A great beginner's soft coral, the Kenya Tree Coral has a place in every newbies tank! The Kenya Tree Coral Capnella sp. is one of the best beginner corals you can buy. Once established, they are almost bullet proof, with exuberant growth and can be successfully propagated. Most people have them growing with ease in their tanks. Out of all of the genera in the Nephtheidae family, the Kenya Tree Coral is by far, the strongest you can buy. If you join a local reef club you may not even have to buy one, as many reef tank keepers are happy to hand them off to a fellow reefer. The Capnella genus has an erect tree-like structure with lateral branches that are heavily forked. On the top of the branches there are clusters of non-retractable polyps. The base or stalk is without polyps and appears smooth. The stalk is shorter on the Capnella coral than on its close relative, the Tree Coral Lemnalia Sp., which looks like a tree with a long trunk when erect. Though its stalk looks smooth, it has sclerites which makes the surface rough. Sclerites are tiny calcium bodies, similar to various sizes of tiny rice, that help support the coral. This gives the surface a rough feel rather than a slimy feel. Quite different from another similar looking coral, the Colt Coral Alcyonium sp., which is slimy to the touch. The colors of the Capnella corals are pretty basic. It has a stalk that is usually cream to brown, with some having a tint of green. The colors of the polyps are brown to greenish brown, and some color variations. Oddly, this coral has been known to mysteriously change colors. Blue lighting may bring out more green and blue colors. Some common names these corals are know for are Kenya Tree Coral, Tree Coral, Cauliflower Soft Coral, Broccoli Soft Coral, Brown Cauliflower Coral, Tree Soft Coral, and African Tree Coral. Some aquacultured names are Neon Pineapple Tree Coral and Taro Tree Coral. The Kenya Tree Coral can be easy to moderate to care for. They come from a more nutrient rich environment. Although they use the symbiotic algae, zooxanthellae, that lives within their tissue, they are more dependent on outside food for survival. They depend on foods in the water column like phytoplankton more so than light. They do like a moderate light, but must be acclimated carefully if you wish to use metal halides, or better yet, positioned under a ledge or another large coral if present. They also need a good turbulent water flow. Do not expose them to fresh water when topping of your tank. This stresses the coral and may lead to an eventual demise. Kenya Tree Coral, Capnella sp. The Kenya Tree Coral can be easy to moderate to care for. They come from a more nutrient rich environment and they are more dependent on outside food for survival. They depend on foods in the water column like phytoplankton more so than light. This coral does not need to be under Metal Halides, but they still need good turbulent water flow. Do not expose to fresh water when topping of your tank. This stresses the coral and may lead to its eventual demise. Distribution / Background Soft Coral Information: The Capnella genus was described by Gray in 1869. There are about 21 species with a few being C. arbuscula, C. erecta, C. gaboensis, C. imbricata, C. rubiformis, and C. watsonae. Some common names these corals are know for are Kenya Tree Coral, Tree Coral, Cauliflower Soft Coral, Broccoli Soft Coral, Brown Cauliflower Coral, Tree Soft Coral, and African Tree Coral. The Capnella genus has been propagated in captivity., and some aquacultured names are Neon Pineapple Tree Coral and Taro Tree Coral. Where Capnella Corals Are Found: The Capnella genus are found in the Indo-Pacific and the Red Sea. Capnella Coral Habitat: The Capnella genus tend to grow on deeper reef slopes where the water is clear with stronger currents. They will cover large expanses at depths of around 19 feet (6 m), colonizing hard substrates of stones and coral. Status The Capnella genus is not on the IUCN Red List for Endangered Species. Description What do Capnella Corals look like: The Capnella genus have an erect tree-like structure with lateral branches that are heavily forked. On the top of the branches there are clusters of polyps which are non-retractable. The short base or stalk looks smooth, without polyps. Though its stalk appears smooth, it has sclerites which makes the surface rough. Sclerites are tiny calcium bodies, similar to various sizes of tiny rice, that help support the coral. This gives the surface a rough feel rather than a slimy feel. Within their stalks and branches, there are "gastrovascular" canals that let them expel water and collapse. Some species are short and squatty with the colonies having short thicker branches coming out of a common, even thicker stalk. At the top of these branches there are several groupings of polyps that form in a similar shape to the cotton part of the Q-tip. On species which are branching, the groupings of polyps extend from the start of the branchlet, and extend to the tip. These branchlets grow out of a large main center stalk that usually grows upward. C. imbricata has short compact colonies with branches that grow upward from the main stalk and the polyps are crowded. The polyps of the Capnella genuscannot retract. The colors of the stalk is usually cream to brown, with some having a tint of green. The colors of the polyps are brown to greenish brown, and some color variations. This coral has also been known to change colors. Different species will grow from 6" to 16" (15 - 41 cm). Difficulty of Care Soft Coral Care: The Kenya Tree Coral Capnella sp. can be easy to moderate to care for. They come from a more nutrient rich environment, so they depend on foods like phytoplankton more so than light. This coral does not need to be under Metal Halides, but they still need good turbulent water flow. Do not expose to fresh water when topping of your tank. This stresses the coral and may lead to its eventual demise. 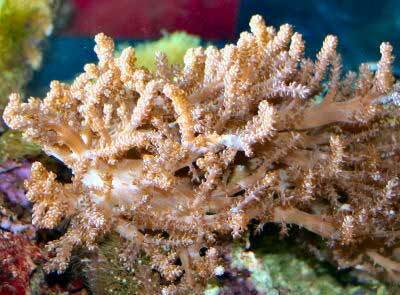 Foods / Feeding Soft Coral Feeding: In the wild, Capnella corals have developed several feeding strategies. They capture microscopic food particles from the water column, can absorb dissolved organic matter, and have a symbiotic relationship with a marine algae known as zooxanthellae, where they also receive some of their nutrients. In captivity, although they use the symbiotic algae that lives within their tissue, they are more dependent on outside food for survival. They can be fed microplankton, marine snow, phytoplankton and similar foods. With fish in the tank as well, the dissolved nutrients they produce will help keep it healthy. Experiment with different "green waters" to see which phytoplankton species they prefer. Aquarium Care Stable tank conditions are needed to keep the Capnella genus. Doing water changes of 20% a month or 10% biweekly is needed, although it is suggested that doing 5% water changes once a week will replenish many of the needed additives. Soft corals still need to have proper chemical levels for proper growth. This family of corals does well with trace elements, especially Iodine and Strontium. A typical live rock/reef environment is what is needed for your Kenya Tree Coral, along with some fish for organic matter production. Provide proper lighting and water movement. They like a moderate light, and must be acclimated carefully if you wish to use metal halides; or better yet, positioned under a ledge or another large coral if present. They also need a good turbulent water flow. The Capnella genus is semi-aggressive toward other corals if the corals are weaker. Compatibility and Social Behaviors The Kenya Tree Coral does give off chemical toxins to ward off encroaching corals, yet can be susceptible to the chemical toxins of other corals as well. The chemicals will affect hard corals if the colony is large, yet out of all of the genus in the Nephtheidae family, the Capnella genus is the least toxic. It all seems to depend on the size of the Kenya Tree Coral colony and that of the other corals, as far as who is affected. For example, one aquarist noticed that their Kenya Tree did not seem to do well in a tank with a large amount of Xenia present. After a Xenia wipe out, their Kenya Tree Coral thereafter grew and flourished and the aquarist could not get new Xenia to grow. Try adding chemi-pure, reef carbon, or similar agents to see if this may help resolve these "wars" of chemicals that are floating about. "In a 40 gallon tank with some small Montipora frags, I also had a 4" Kenya Tree Coral. I wondered why my Montipora frags were not really growing, since after all the Kenya Tree is supposed to be more innocent. All my chemical levels were fine. After reading about softies being hard on SPS, I decided to remove the Kenya Tree (and gave it a good home!). Shortly afterward, my Montipora corals grew quickly!"... Carrie McBirney. Potential Problems The Capnella genus is susceptible to stress from shipping. At times commensal creatures that were within the branches, undetected by divers, will die in transit, thus affecting the coral. In the main display, prolonged deflating or a deterioration should be handled quickly with the coral being removed to a quarantine tank. Soft corals can make a mess of your water quality if they die, as well as infecting other soft corals if they happen to be diseased. If you acquire a Kenya Tree Coral and it is deflated, put it in a moderate water flow to help it "revive" itself. Availability Soft Corals for Sale: The Kenya Tree Coral Capnella sp. is very easy to find pet shops and on line. Online they can run about $30.00 to $50.00 USD and up, depending on size and/or color. If you are in a reef club, there is usually someone willing to give them away for free!